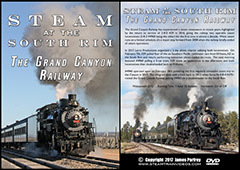 This program takes a look at both operable steam locomotives on the Grand Canyon Railway: 2-8-0 #29 and 2-8-2 #4960. 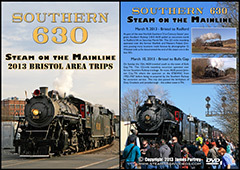 While #4960 has been the face of the railroad for 2 decades, #29 was returned to service in 2016 after being on display for the previous 8 years. 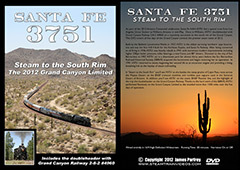 Diesels still handle almost all the trips to the Canyon, but steam is now being used more frequently, with both locomotives featured on special trips throughout the year. 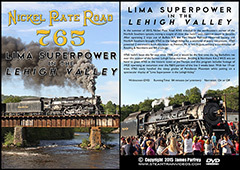 Our coverage starts in February 2017, with a 2-day Lerro Productions photo charter. 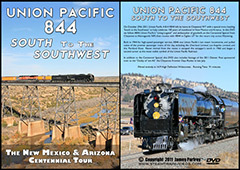 On February 7th, #29 pulled four of the former Southern Pacific commuter cars from Williams, AZ to the South Rim and return, performing numerous photo runbys en-route. 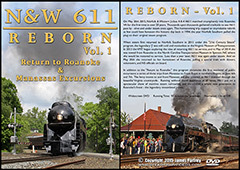 The next morning featured #4960 pulling a 5-car train as far as Coconin; #29 then joined us in the afternoon, and both locomotives doubleheaded back to Williams. There was plenty of snow on the ground near the Canyon, and you'll see lots of spirited runbys on the scenic 64-mile long line. 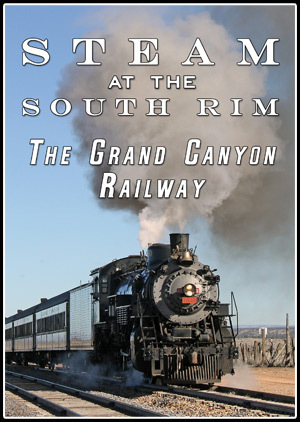 Then on February 18th, #4960 pulled the first regular steam-powered trip of the year to the Grand Canyon. 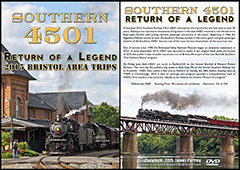 You'll see #4960 on a cold, windy, and wet day as the locomotive climbs some of the steep grades between Williams and the South Rim. 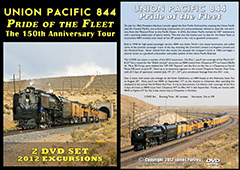 As an added bonus, this program includes footage of Santa Fe 4-8-4 #3751 during a visit to the railroad in May of 2012. 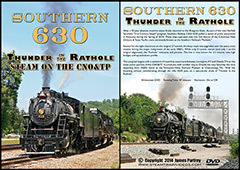 We'll take a look back at a doubleheader with #4960 and #3751, which was the last time #3751 ran on this former Santa Fe branch. 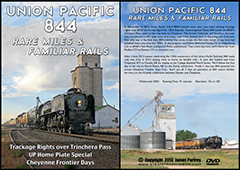 Filmed entirely in HD, this video features 40mph running, 3% grades, and the varied scenery of northern Arizona. This program has minimal narration (with the option to turn it on or off) and no distracting music. 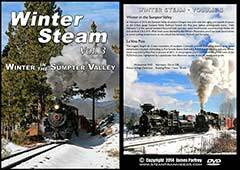 In February of 2014, the Sumpter Valley of eastern Oregon was alive with the sights and sounds of steam, as the 3-foot gauge Sumpter Valley Railroad hosted its first ever winter photography event. 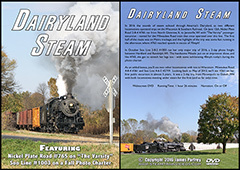 Held on February 1st and 2nd, this special weekend featured both operable steam locomotives: wood-burning Heisler #3 and oil-fired 2-8-2 #19. 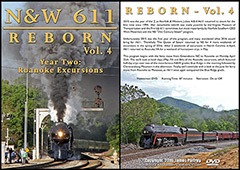 This program chronicles the 2-day Lerro Productions charter, as both locomotives pulled mixed trains on the rebuilt trackage between McEwen and Sumpter. 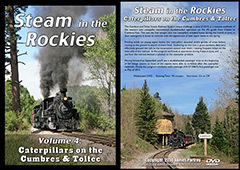 With fresh snow blanketing the nearby Elkhorn Mountains, you'll see a variety of runbys as we explore this often overlooked narrow gauge line. 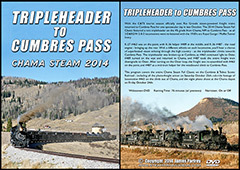 In addition to the Sumpter Valley coverage, this program includes footage from January of 2011, as Rio Grande Scenic Railroad 2-8-0 #18 pulls an excursion over La Veta Pass in southern Colorado. 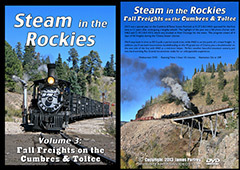 This was the first and only time the railroad has ever operated steam over the pass in the winter. 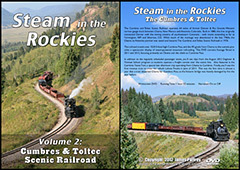 The surrounding Sangre de Cristo Mountains completely dwarf the train, providing a stunning backdrop to some remarkable mountain railroading. 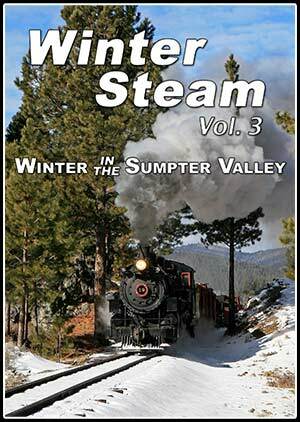 While this footage was originally included on Winter Steam Vol. 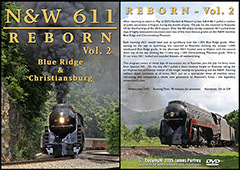 1, it's been re-released on this program so it can now be enjoyed in full High Definition on the Blu-ray version. 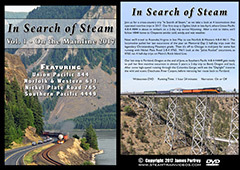 Filmed entirely in HD, this program features great steam action amidst beautiful western scenery. 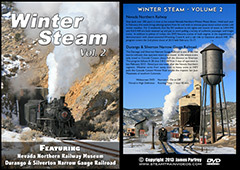 Winter Steam Volume 2 looks at two classic western steam railroads: the Nevada Northern in Ely, NV and the Durango and Silverton in Durango, CO. Filmed over 2 weekends in February 2013, this program features great steam action amidst cold winter weather. 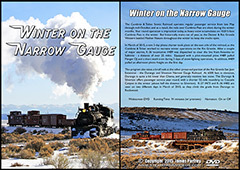 The first segment covers the 2nd weekend of the annual Winter Photo Shoot at the Nevada Northern Railway Museum, held February 15-17 2013. 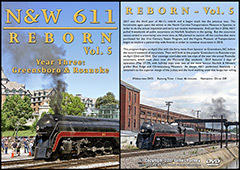 2-8-0 #93 and 4-6-0 #40 were both steamed up for the event and you'll see plenty of runbys with both passenger and freight trains. 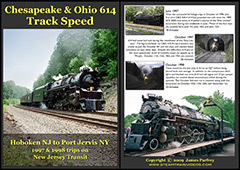 In addition to the action out on the line, you'll see scenes from the enginehouse and yard complex, including a demonstration with steam-powered Wrecking Crane A. We'll also climb aboard #40 for cab ride to the end of the line at Keystone. 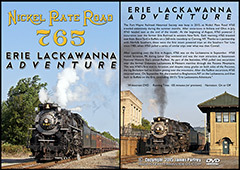 The railway is so well preserved; it truly feels as if you've traveled 100 years back in time. 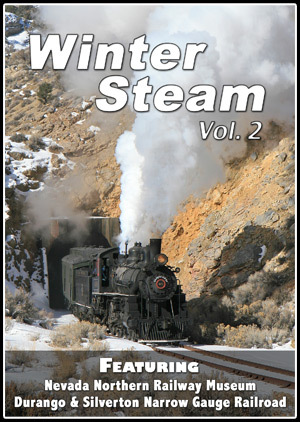 Steam in the winter is a spectacular sight, made all the more special by its rarity. 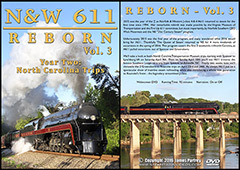 The winter is a slow season for tourism, and most operators use the time to perform necessary maintenance on locomotives and rolling stock. 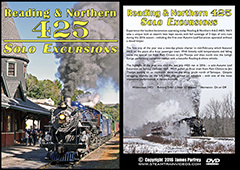 This DVD showcases four winter steam excursions. 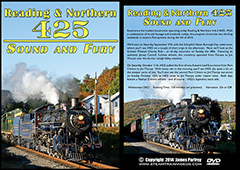 It includes the annual Tobyhanna Ice Harvest Train at Steamtown NHS in Scranton, PA. We'll see the 2009 train, which operated on a bitter cold day, right after a major snowstorm. 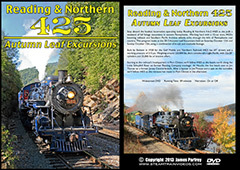 Next follows a short segment on the Cascade Canyon Winter Train on the Durango and Silverton Narrow Gauge Railroad in Colorado, with locomotive #482 re-lettered as the 'Polar Express' for the Christmas season. 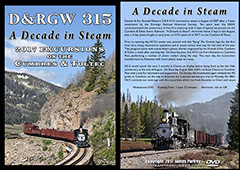 The rugged Sangre de Cristo mountains of southern Colorado provide a stunning backdrop for the first ever winter steam special on the Rio Grande Scenic. 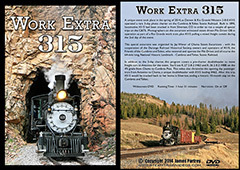 In the third feature, you'll see spectacular views of 2-8-0 #18 working on both sides of La Veta Pass. 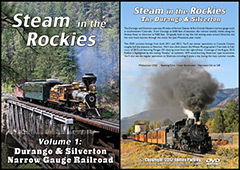 Finally, the last feature is a more in-depth look at the regularly scheduled Cascade Canyon train on the Durango and Silverton. As the snow melts at the lower elevations, we'll follow 2-8-2 #480 along the Animas River on four days of operation in early March. 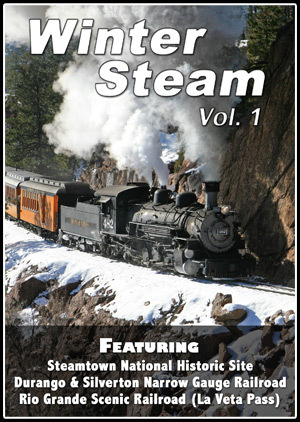 There is no distracting music or narration on this DVD; just well-filmed and well-edited clips of steam locomotives working hard amongst breathtaking mountain scenery. 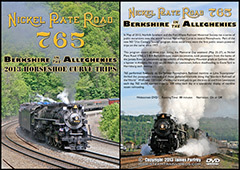 This DVD is sure to please any fan of steam railroading.